Ten years ago the Magna Carta brand was the envy of the progressive metal world. Despite being hamstrung by the fact that it was based in the States; a label roster that included the likes of Cairo, Ice Age, Explorers Club, Tiles and the brilliant Shadow Gallery put them on equal footing with anything you could find this side of the pond. Unfortunately, the label is now but a pale imitation of what it once was, but if this release is anything to go by, things might actually be looking up again. 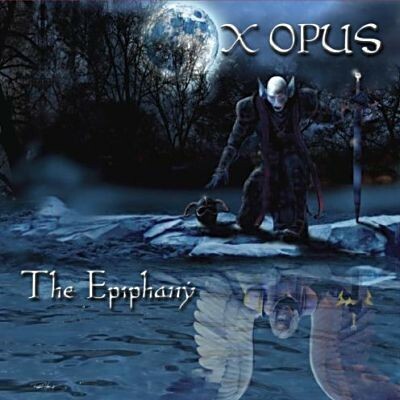 The brainchild of composer/multi-instrumentalist James Williams, X Opus is a relatively new project which dishes up a challenging mixture of progressive, power and neo-classical metal with the odd dash of Goth and a sprinkling of death metal vocals (although thankfully, their sparing use is rather effective in heightening the dynamic of the other influences in the X Opus armoury). Whilst Williams’ composed and played (or programmed) most of the instruments here, all vocals on debut release ‘The Epiphany’ come via a pair of Texas based singers – David Crocker and Brad Dixon to be precise. I have to admit that hearing fluid neo-classical guitar doodling in such a progressive setting is a bit challenging at first because the two do seem to be rather odd bedfellows, but after a while you get use to it and in a strange way, it’s actually quite refreshing. The production could have been better (some of the transitions are far from seamless with instruments fading in and out all over the place), but if you’ve ever wondered what would happen if Malmsteen met Symphony X, then wonder no more. The songs themselves are ambitious and generally well articulated; there’s a raft of tempo shifts and revolving moods to keep you interested throughout, and the melodies are consistently strong (if perhaps a tad generic). On reflection, whilst ‘The Epiphany’ has plenty of merit this is possibly a tad too ambitious for a first effort, although there’s no doubting Williams’ commitment or talent. On that score then it’s a more than strong enough base on which to build, and I for one am more than a little curious to hear what would happen if the guy was put in a proper band situation with an experienced progressive metal producer.